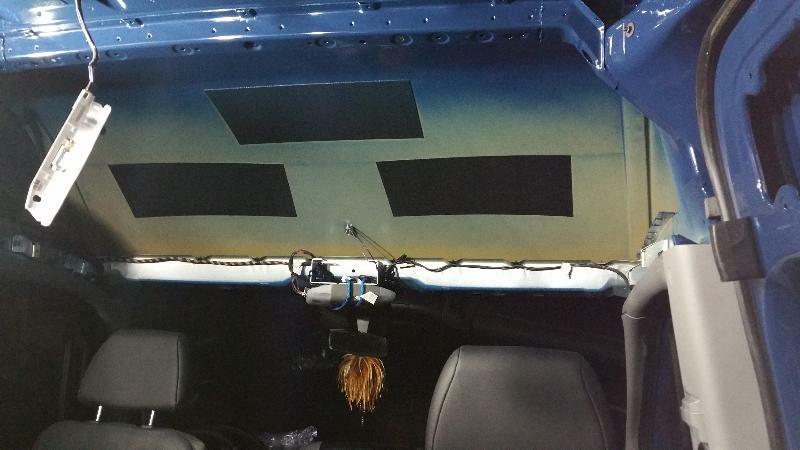 Summary (TL:DR): Removing the headliner was very frustrating. The existing plastic rivets are a huge pain to remove without breaking. Solution: remove all the factory plastic rivets and replace them with stainless bolts and washers, threaded into rivnuts (or plusnuts!). 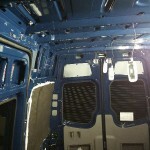 When we opted to buy the crew style Sprinter van we did so because we thought it would make it a lot easier to finish. This is probably still true. But I think I failed to grasp that I would have to remove the headliner (several times) before the van build was complete. And let’s just say the factory headliner is not installed in fashion that it is easy to remove again. For us, removing the headliner was by far the hardest part of the van build. 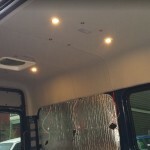 Forget cutting holes in the ceiling, wiring all the electrical, connecting to the fuel tank – nope, easy – compared with popping out all those ridiculous little pop rivets. 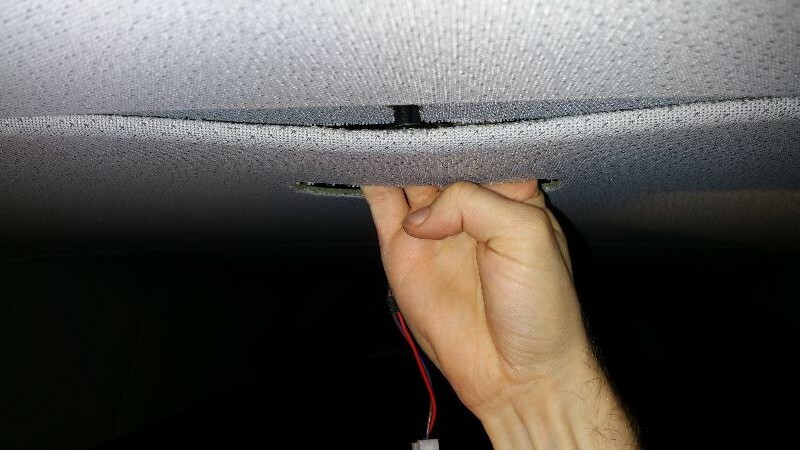 There are several good write-ups that you can find dealing with removing the headliner. I won’t attempt to recreate them. I will, however, offer my 2-cents on the matter. Remove the D-ring bolt at bottom of the driver’s and passenger side “B” pillar using a Torx T-45 wrench. The plastic “B” piller cover can then be ‘popped’ free. Start by grabbing the top and pulling it out – this will pop out the top two of six metal clips holding it to the side of the van. Carefully work your way down popping the other metal clips as you go. At the bottom, some plastic hooks hooks connect the pillar to the metal frame behind it. Once the metal clips have been popped out all you have to do is lift the plastic cover up to disengage the lower plastic hooks and its up and away. When I pulled the B-pillar cover off the slidey part that connects the seatbelt shoulder height adjustment also popped out of the plastic cover. Its easy enough to slide in, but be careful when re-aligning it and make sure it is facing the right way when putting it back together. remove the sun visors by removing the T-30 screws in them. I found that it was easier to remove some of the screws when the sun visor was down and others when the sun visor was up. You’ll see what I mean when you do it. remove the center map-light module by prying down on the right side (passenger side) first, with one of your trim removal tools. The driver side kinda hooks in to the headliner so don’t try and pry it down first. 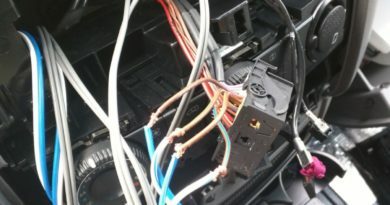 Like others before me I could not figure out how to disconnect it from its wiring so I just let it dangle, passing it through the hole in the headliner when I removed it. 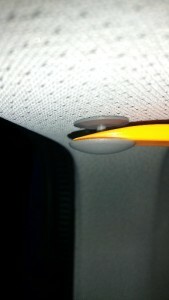 Pop the little speaker covers off on the dash by wedging a trim removal tool under them. They should pop free pretty easily. Pop the “A” pillar’s off by pulling on the top of them, similar to how the “B” pillar’s popped out. Mine were attached with little pieces of webbing so I didnt remove them all the way, just let them dangle from the webbing.BE VERY CAREFUL in this area of the van, as this is where the air bags are. I messed around a bunch in here and didn’t mess up the airbags (honestly I am not even sure how you mess them up) but it goes without saying that popping the air bags, cutting their wiring, or having them accidentally deploy would be a really big bad deal. Once all these connecting pieces are out – then the fun really begins. Introducing the pop rivets from HELL! 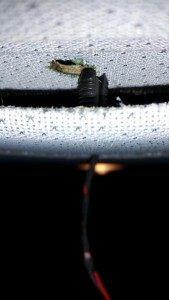 There are two types of plastic fasteners you will encounter when removing the headliner. The friendly black center-push pin rivets and the evil grey pop-in rivets. There are also some imposter grey rivets which are the friendly center-push-pin type. Whatever – you will know what I mean when you see them. For the push pin type black and gray rivets, you need to get your forked trim removal tool underneath the domed mushroom head of the outside ‘pin’ but not under the inside ‘rivet’. The photo at right shows what I am talking about. The black ones work similar to the gray ones, separate the pin part from the rivet part and these come out easily. HOWEVER, this is not so easy because the black pins themselves are wedged under the next panel back. So you have to simultaneously gently pull the panels apart, get your trim tool in there, get the pin separated from the rivet, and get the whole assembly out. Easy. right? almost easy. Compared to the gray plastic pop-rivets, very easy.I would like to tell you some great ways that I found to get these grey destroyers-of-all-faith-in-humanity, but I dont have one. I have heard that if you can get a forked trim tool in between the mushroom head of the pop rivet (the head right next to the metal of the van frame) that you can compress the plastic of the rivet to get it to release without breaking. 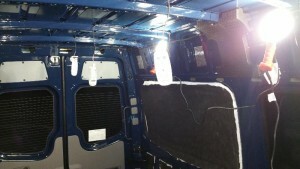 I couldn’t get this to work consistently – most of the time I couldn’t even reach the pop rivets enough with the tool to even attempt it.My method for the pop rivets (starting with the front section of headliner): grab the back edge and pull down, disengaging or braking the final piece that secures the headliner section to the van. You may find that some of the plastic rivets survive the pop. some will not. this may or may not matter to you at this point in time. 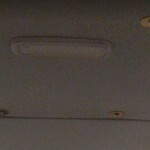 From there you can pull the front section of headliner back and down and roll it out the side door of the van! Hooray section one is done!… but it’s not over yet (if you have a crew van too). From here on out there are no more screws to undo, just a lot of the different type of light grey, dark grey, and black rivets to pop out. I wish I had more pictures of the process but honestly I was so frustrated through the entire thing I didn’t get any good photos. I will say I got through it and only broke maybe half-a-dozen of the grey pop-rivets. The only other thing to note, besides the carefully prying of panels apart to remove said rivets is at the sides of the van. 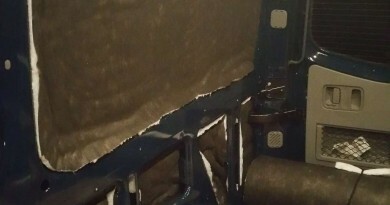 There are tabs (part of the headliner itself) that slide into the side walls. 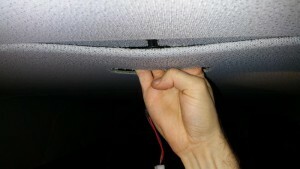 To get the tabs out and away from the side walls push up and in on the side wall of the headliner. Then once you have moved it up an inch or so you can pull it back and the tabs will slide right out of their slots. I recommend taking the headliner out starting at the front of the van. If you use my method for putting it back together, you can do it in any order. As you may well have noted from the above, I did not take too kindly to the rivets in the headliner. Because I knew this headliner removal thing was going to happen a few times I decided to take matters into my own hands for the re-installation. Rather than subject myself to rivet hell several times I decided to replace all the ceiling headliner rivets with screws into 1/4-20 rivnuts. This method proved to be an amazing time saver. 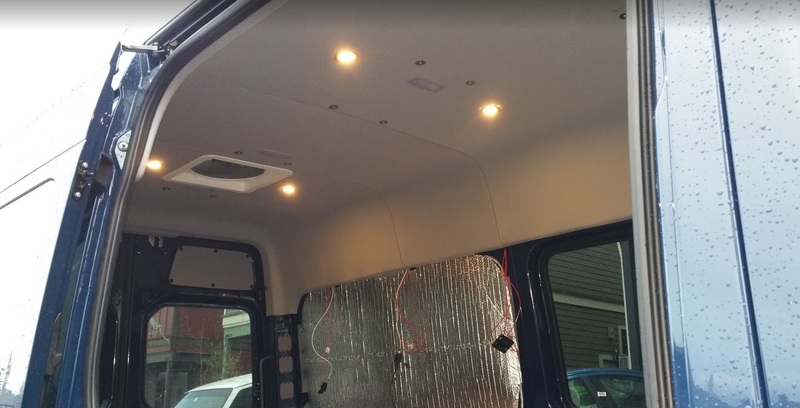 I had to cut a notch out of the adjacent panels in order to allow the panels to slide together how they need to and drill new, carefully measured, holes into each headliner in order to accommodate the bolts going through, but in the end I think it turned out very nicely. And the subsequent times I have had to pull the headliner for various reasons have been so much easier! 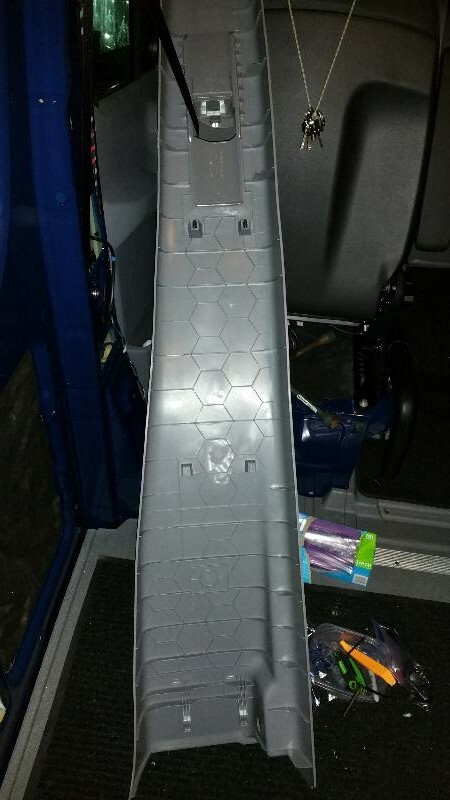 Just remove a few bolts and slide the headliner right out. UPDATE (4/2018): We later replaced the headliner completely with a wood panel ceiling. See this post: New ceiling and Wall Panel Installation, for details. I just powered through this last night, and your description of the process has been the best I’ve found for a front airbag equipped van. Most (all?) 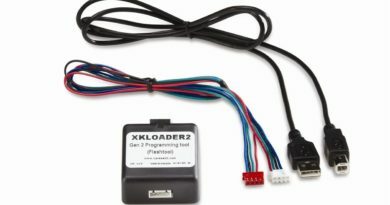 the other ‘how-to’s’ are for older non-front airbag rigs. Long story short, 1. accept that you’re gonna break most of the grey plastic trim inserts and just pull them down, 2. completely unbolt the airbag assembly at the B-pillar and loosen it at the A-pillar – this will allow it to drop out of the way so the headliner can drop and pull out. Otherwise the system is over constrained and you’re just punching yourself in the face for fun. Love the web site, thanks all kinds for putting the energy into it! Hugely helpful. Glad it worked for you! You are definitely bolder than I am with the airbags. Those things made me so nervous. I tried to avoid touching them as much as possible. But good to know it can be done. 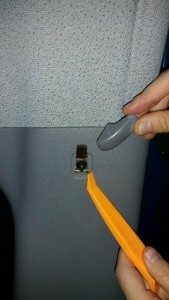 Agreed with the gray plastic inserts – not worth the hassle to save them. That’s why we changed out ALL of our inserts with 1/4″ bolts into rivnuts. 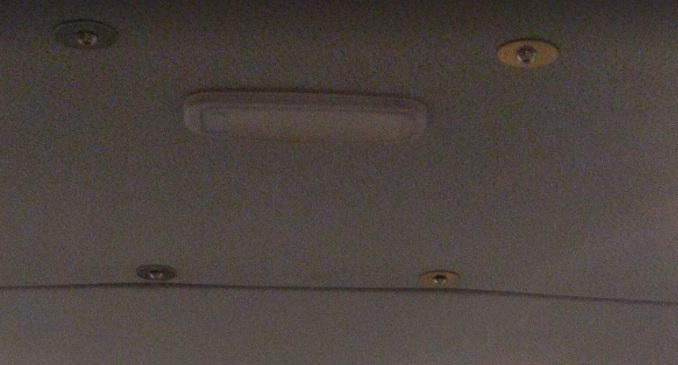 Made everything so much easier the second time around pulling the headliner (and the 3rd and 4th….). Hope your van build continues to go great! If you have questions about anything on the site, feel free to ask in the comments – I try to be good about responding. 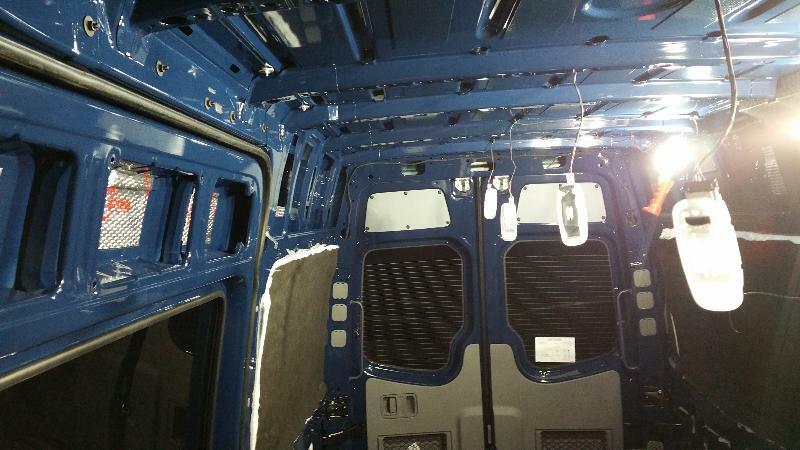 I have the same headliner in mine and plan to remove it soon so I can run wiring for electrical and insulation, and maybe some lights and a vent — I’m now going to do that all at once to save on taking that frustrating looking headliner out. Thanks for the info!